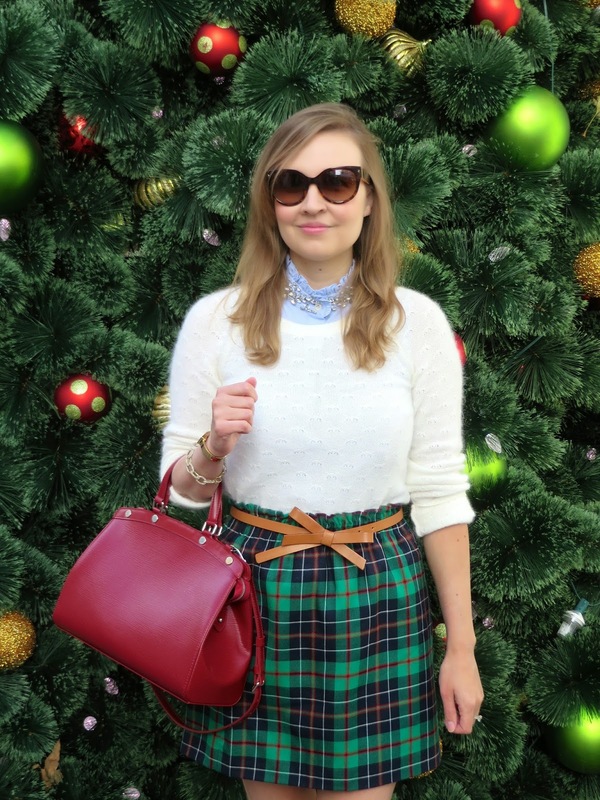 What's more Christmassy than plaid, a fuzzy sweater, bows and glittery gold shoes? Nothing! Well, there are some things, such as standing next to a gigantic Christmas tree. While doing some last minute Christmas shopping amidst a throng of other holiday shoppers, I took a few pictures of today's very holiday inspired outfit. (This was, of course, along with all the kids whose moms were also trying to photograph them next to the tree. It was very embarrassing for me!) My husband asked me, jokingly, if I would like to stand in line to sit on Santa's lap with the other kidos, but I declined. I don't think Santa wants to hear about the Louis Vuitton I want for Christmas! Bag: Louis Vuitton Brea in "Rubis"
I want to steal that skirt and bag right off. What a beautiful holiday outfit Ms. Katie. Haha! Thank you Ada and I hope you and your family also have a wonderful Christmas! Super cute look love that plaid skirt. Coming by from the Let It Shine linkup! Thank you for stopping by Ashley! You are looking so ready for the holiday! I love your adorable plaid skirt. Thank you! 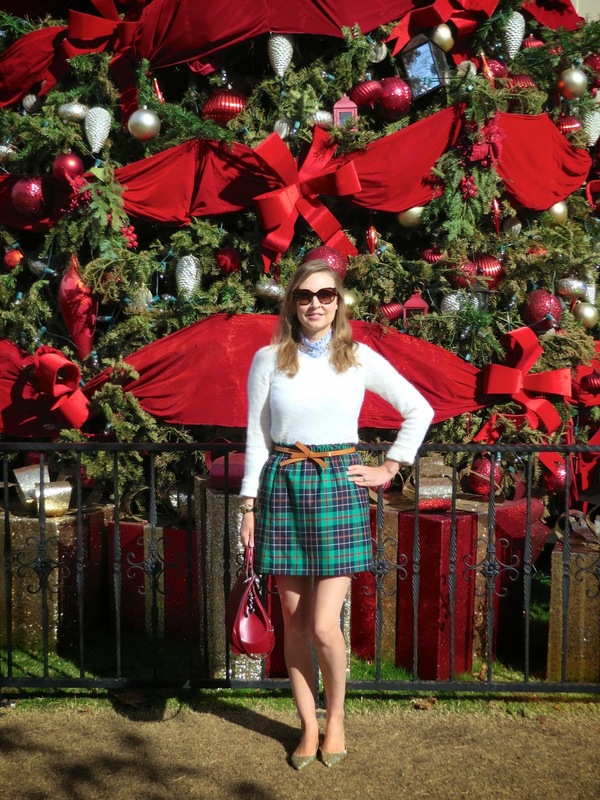 I bought this skirt a couple years ago and it's one of my holiday favorites! Love your plaid skirt! So holiday ready! I love your plaid skirt and bow belt! Such a festive look! Your plaid skirt is so cute and I love that bag! a very festive tartan that you look fantastic in! wow! oh, and you have amazing legs, too!